Thanks for the thumbnail. It confirmed that I do not have insider preview running. It shows "let's get started" or some such. Looks like I will have to keep deleting the message even though I no longer have CCleaner currently installed while try to sort this problem out. If you don't have an insider build then "Get Started" is indeed what you see instead of "Stop Insider builds". Sorry about the confusion, but it makes it even more strange that the error message you are getting mentions 'windows insider preview'? I recently upgraded to windows 10 and started to get the message "your app isn't compatible with windows insider preview" every time I started my computer. What made you think that this is a problem with CCleaner? Yes there is obviously a problem here, but that message just says "your app" it doesn't say which app. Indeed if you have removed CCleaner from your system and are still getting this error message then it must be some other app. that is the problem. Have you run Virus, spyware, and malware checks on your computer, if so which ones? Run a scan with your installed Antivirus. If you don't already have a spyware and malware scanner I recomend that you get these and run them to check for nasties on your computer. The free versions are fine and are used and trusted by millions around the world. Of course these are just my recomendations, I have no association with any of these companies. Other Malware / Spyware scanners are available. Checks your system for any nasties that are trying to track what you are doing, steal your passwords, steal your personal info, etc. Run it once a week - takes between 20min and 2-3 hours depending on what you have on your hard drive. AntiMalware - Definitely use this - Checks for all kinds of nasties and unwanted stuff that tries to take over your computer. Run it once a week - can take up to a couple of hours depending on what you have on your hard drive. If after running these you are still having problems I (and no doubt others here) can point you to where you can get free 1-1 help to deep analyse and clean up your computer. Although I have security software installed, I down loaded and ran the Malware and it came up with no problems. There has to be something in the startup that triggers the false message. Also while the message stated that it had deleted the CCleaner software, I don't believe it did. as it was running and I had to uninstall the software in order to get a clean slate. I know under window 8 there was a virtual file where programs ended up for some reason. For I had a situation where I had down loaded a module for a certain software and it ran fine. However, I could never find the file when I did a search. I contacted the software manufacturer and he said it was probably in the virtual file. I eventually found it and move it to where it should have been and deleted the virtual file. I believe that windows 10 no longer has this virtual file system so that can be ruled out. Can you advise where to find windows 10 start up file? The easiest way to find out what is in the start up list is to look in Task Manager. Right click in the Taskbar and select Task Manage from the pop up menu. Go to the Start-up tab and it will list your loaded start up apps, and tell you if they are enabled or disabled. You can try disabling them one at a time and re-booting to see which one is causing the error message. I have done some searching about and it seem that on certain PCs (not all) this message about 'apps not being compatible with Insider Preview' will display even when the PC is running a full market version. (It was lazyness on Microsofts part when releasing a fully tested insider build as the full market version and forgetting to change the message). The message displays when Microsoft has decided to remove apps it does not like from your system. Among the apps that it will remove are CPU-Z, Speccy, CCleaner, bing bar, NETGEAR Genie, and there are others. There are already various posts about Microsoft doing this here and on other forums. Generally (uninstalling and) reinstalling the offending app cures the problem. So once you have worked out which app is generating the message you can uninstall / reinstall it. I fiddled with some default setting - not sure what I did, but I no longer have the error message when I start my laptop. Thanks for your help. It is a bit frustrating not knowing what was going on. The big test will come when I download CCleaner again. Possibly turned off- 'Show app notifications' (in the Systems > Notifications & Actions screen)? Would have been nice if you could have found just which app the message was refering to. At least the message has gone now, (if not the actual incompatability). Confirmed, CCleaner just broke my Windows installation. Now I get to spend today fixing my computer after Piriform's incompetence killed it. CCleaner is malware now. Thanks, Piriform. I run Ccleaner on my Windows 10, Win 7 and XP and it hasn't broke any of them. You need to give a lot more info before people will take notice. Coming on forum and saying ''Ccleaner broke my machine'' just doesn't suffice. I ran CCleaner. Immediately afterward, no programs could launch. After restarting, Windows could not load. Refresh Windows. Still can't load. Windows needs to be totally reinstalled. CCleaner broke it that badly. 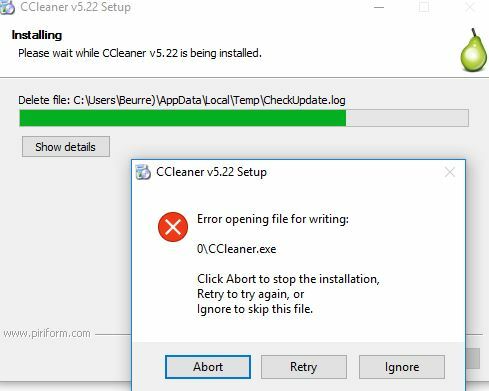 Is this the first time you had used Ccleaner? What settings did you have it set to clean? Did you use the registry part of the cleaner? Was Windows 10 fully up to date with this weeks' big update...had you rebooted to install that update yet? Windows 10 was up to date. I did not use the registry cleaner. I used to be a CCleaner advocate and would regularly use it. Default settings, minus some browser stuff, plus clean up old windows installations. No warning message or anything it wiped most of Windows. Now I need cancel all of my plans to spend all day fixing my computer because you guys thought deleting the operating system (rather than cleaning up windows.old) was a good idea. Thanks. Please stop saying 'you guys' as though we are personally responsible. We are just members who try to help other members okay? First when this is over you MUST make a system image then when things go wrong (as they often do on computers) you can just restore an image. If you have never done that before and need advice on it... please ask. Most folk around here use Macrium Reflet, it's free. Secondly it is better to use Windows inbuilt Disk Cleanup for old win installations, especially on Win 10 which is constantly changing. Thirdly no need to spend all day on re-installing 10, just download the Win 10 iso and it doesn't take too long to install. Reinstalling all of my other programs too. ArcGIS, VS, etc. That takes a while. And CCleaner managed to break Windows so badly that I can't even use the recovery reinstallation option. That is not a trivial issue. CCleaner is fatally flawed. No software should kill someone's computer so easily. Now seriously you must stop posting in other threads about this, you are getting help and advice, but for some reason you just want to keep putting up posts about how ccleaner is malware, dangerous, and kills computers etc etc. I am getting fed up with deleting them all. You are starting to come over as a troll instead of someone who is looking for help. There is lots of info online about doing a clean install of Windows 10, it gets auto activated and the iso contains all things that you need. If you need to ask any questions please do. It is on topic though. CCleaner damages Windows 10 and as such it makes sense that MS would discourage its use. Ccleaner doesn't damage Win10, you are now just repeating the same thing. Microsoft doesn't discourage the use of Ccleaner. It is just one of the (many) apps that they don't like running when doing an upgrade from say Win7 to win 10. I've been using CCleaner before and after upgrading my Windows 7 to Windows 10. There seems to be no problem with it and it's been cleaning my computer fine. Try to reinstall a fresh new CCleaner after upgrading or after downgrading your Operating System. I'm a licensed user of CCleaner Pro 5.20 that has been running flawlessly on my desktop running Windows 10 v1511 64-bit but after updating it to Windows 10 v1607 64-bit the application was removed by the compatibility assistant. I've tried installing it again and encountered stability problems with the OS before having the compatibility assistant remove it again. When will a compatible version of CCleaner be released? the upgrade to WIn10 v1607 (anniversary update) didn't remove CC for me. what were your stability issues? 2 laptops 1 pc cookie cleaning is a mes,no cookies i can choose to keep.....WIn10 v1607 IE. Elected to upgrade to Windows Anniversary Edition yesterday, which uninstalled CCleaner Professional version 5.21.5700. Following a successful reinstall, I cleaned out the crap and cleaned the registry. Today, upon rebooting Windows, I received a belatedly MicroSoft notification telling me it removed CCleaner due to incompatibility issues. Oddly, my reinstall is still present, accessible, and functioning. Following advice on page one of this discussion, I opened an administrative command prompt and ran the two recommenced commands. The first: dism.exe /online /cleanup-image /restorehealth reported “The restore operation completed successfully”; the second, sfc /scannow reported “Windows Resource Protection did not find any integrity violations”. Again, my reinstall is still present, accessible, and functioning. 1/ Microsoft protected the integrity of its update by uninstalling applications that could conceivably cause Windows 10 to become corrupted. 2/ CCleaner was and remains fully comparable with MicroSoft's operating system. I am a group leader of a scrabble group which uses Mattel scrabble , the only thing that helps the friends list is the cleaner and I have recommended it successfully to hundreds of people to help with this problem. Today both my laptop and desktop went into updates for Windows 10 and cc remover taken off and not cannot install without an error . i cant even managed to download an old version . Will Piriform be taking up the cause with Microsoft along with Facebook its a very well used and liked program and I am very sad its been taken off with this Microsoft update. I tried feeding back my feelings on this to Microsoft but got the biggest run around for passwords i had to give up before tossing both computers. firstly, try uninstalling the current CC version, reboot the PC then install CC again. also, although previous versions aren't listed on the Piriform site, they are available from FileHippo.